As you can tell from my Tokyo Michelin Guide ramen list, I’m actually missing reviews for quite a few of the restaurants. My go to lists of restaurant is quite extensive and with some of the restaurants listed on the guide being so far away from both my office and home, I haven’t had the time to visit them. A couple months ago, however, I was approached by a fellow ramen enthusiast and Youtuber Nama Japan if I would be interested in filming a video with him for his channel. Not one to pass up on an opportunity to eat ramen, and a Bib Gourmand no less, we scheduled to meet at KaneKitchen Noodles near Higashi-Nagasaki station. Despite the name of the station, KaneKitchen is not in Nagasaki and is in fact located in the Toshima district of Tokyo, just a short train ride from Ikebukuro on the Seibu Ikebukuro Line. KaneKitchen Noodles is open 11:30～15:00 for lunch and their dinner hours are 18:00～21:00 while being closed on Wednesdays. While being open on Thursdays, they operate under a different brand, NiboKitchen Noodles, serving up only Niboshi Ramen during that time. Nama Japan and I decided to visit on a Saturday around 13:00 and was seated immediately. The restaurant is located on the second floor so keep your head up when looking for the shop. I actually walked right past it when I was meeting Nama Japan and didn’t realize where it was until he pointed it out to me. You can really tell KaneKitchen worked on the design of the shop for that Michelin Guide recognition. It’s a very modern, chic restaurant with both counter and table seating inside. If you’re going as a group, this place would be perfect for that. In terms of menu selection, KaneKitchen offers three main ramen varieties and three specialty menus which changes seasonally. The three main ones are the Shoyu Ramen on the top row of smaller buttons, Shio Ramen on the second row, and the Niboshi Ramen on the thrid row. Prices for all three are consistent and fluctuates based on your topping choices. The very top row with the bigger buttons are the ramen varieties with all toppings (らぁめん全部入り) which includes 3 pork char siu, 3 chicken char siu, and a soft boiled egg for 1200 yen. The 1100 yen option includes 3 pork char siu and 3 chicken char siu with no egg, 1000 yen option is for two each of the char siu and a soft boiled egg, 880 yen includes just the egg, and the 780 yen is just the ramen with one char siu slice each. Side menus here include a char siu over rice, regular plain rice, and a daily special rice bowl. In addition they serve Heartland and Yebisu beer (the very bottom buttons). The most popular and most recommended ramen is the 1200 yen Shoyu Ramen, but Nama Japan decided on the Tokusei and as I am a sucker for specialty ramen bowls I opted for their Shoyu Tsukemen. The specialty rice bowl also sparked my interest so I added that to my order and we took our seats at the counter. So I’ll start with my review of the specialty rice bowl. On our visit, the specialty rice bowl was a miso pork kakuni with Japanese mustard. As you can see in the picture, the bowl consists of a bed of pillowy rice with miso simmered pork placed in a mound over it. A sprinkle of green onions and a bit of Japanese mustard compliment the pork. I actually wasn’t a huge fan of this bowl. The pork is a bit sweeter than I expected which can be counterbalanced with the mustard, but definitely wasn’t what I expected or preferred. 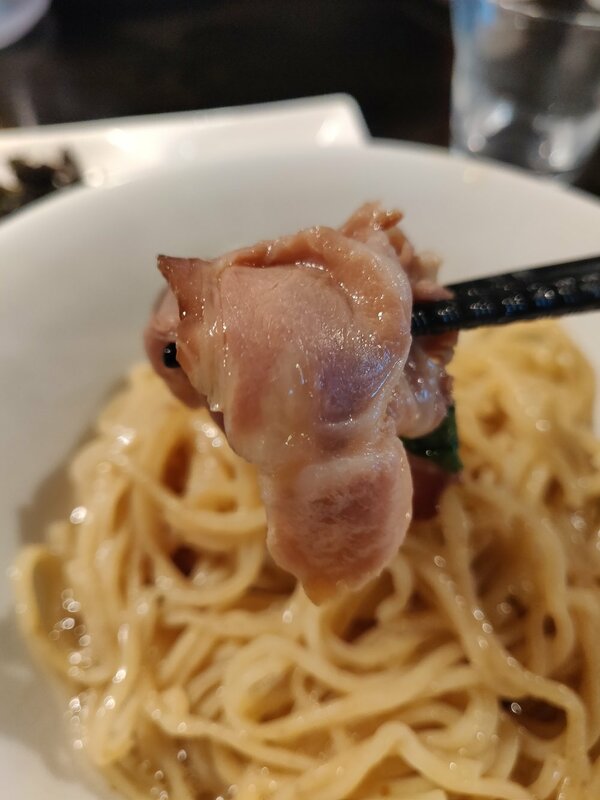 Pork is quite meaty and lean, with just a bit of fat around the edges. It was soft, but since it was more of a lean cut of pork, it wasn’t necessarily a melt in your mouth level of tenderness. The bowl was a bit pricey as well coming in at 300 yen so I was expecting a bit more in terms of portion size. If you end up coming to KaneKitchen, I would honestly skip the rice bowl and go for their famous ramen varieties. Nama Japan opted for this bowl of Tokusei Shoyu Ramen. 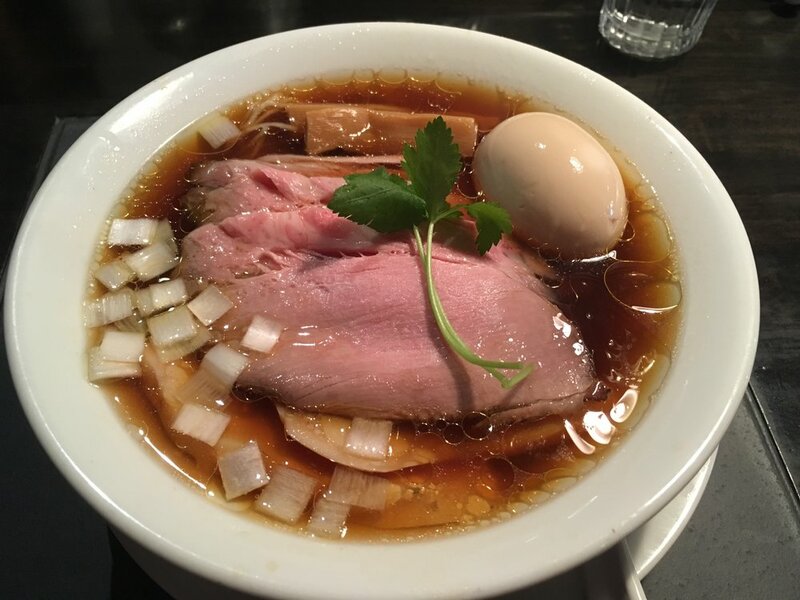 As I mentioned earlier, the bowl comes with two slices each of the pork and chicken char siu, soft boiled egg, as well as a couple blocks of menma bamboo shoots, chopped scallions, and a sliver of mitsuba (Japanese herb). Check out his video below for his review on the Tokusei Shoyu Ramen! So I decided on their specialty menu item, the Shoyu Tsukemen. The main reason I chose the Tsukemen is because they heavily advertised the Konbu Bath soaked noodles. If you’re not aware, KaneKitchen is quite close with a number of Tabelog top 100 ramen shop owners doing collaborations often. One restaurant they are particularly close with is Machida Shiruba Shinka which offers exactly this time of noodles at their own shop. The soup base as Shinka is a Shio, or salt, while the soup here is a Shoyu based. As I was a fan of Shinka’s Shio Tsukemen, I decided I needed to try this Shoyu version here at Kane Kitchen Noodles. The tsukemen set here comes with the noodles in the Konbu Bath, a condensed shoyu ramen broth for dipping, Japanese ground rock salt, dried konbu, and half a sudachi lime. In the soup I had a couple slices of pork char siu and menma bamboo shoots with a sliver of mitsuba (Japanese herb) placed over it. So the order you want to eat their Tsukemen is first just the noodles to enjoy them as served in the Konbu Bath. Next they recommend dipping the noodles in a bit of the Japanese rock salt they provide in the picture with the dried konbu and sudachi. Next, go ahead and dip some noodles in the soup and enjoy the harmony of the two. After you thoroughly enjoyed that combination, add the dried konbu for a topping change, and finally squeeze the sudachi lime to give it a zesty kick. 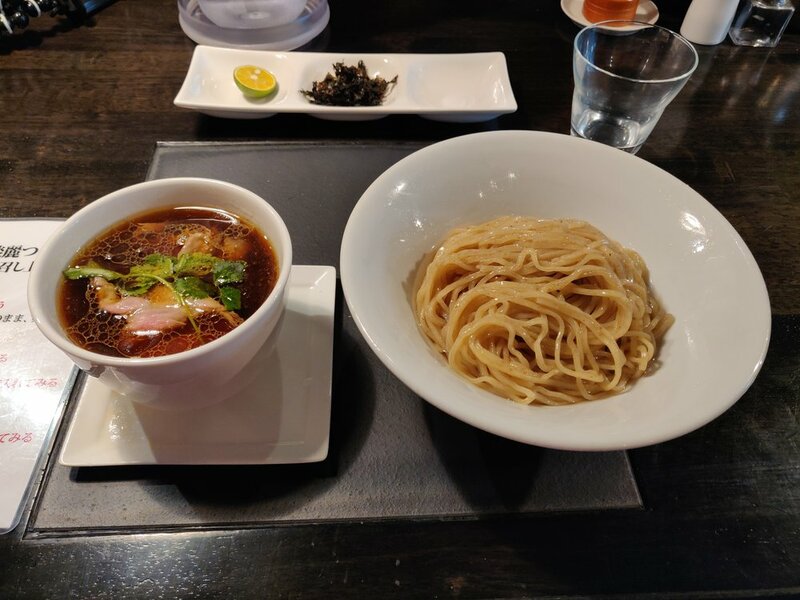 Once you’re done with the noodles, instead of providing a soup wari like most tsukemen restaurants, KaneKitchen recommends pouring the remaining konbu bath in to the soup to tone down the condensed tsukemen broth. I will have to admit, the noodles in the konbu bath blew me away. The bath is a bit thick and viscous, but rather light and gives that flavor of the sea that seaweed tends to give off. Pairing it with the soup was salt was fantastic giving it a nice combination of salty and umami. The soup was also quite good here utilizing a chicken chintan soup which is made through a low simmer of chicken to get a light and airy broth. Combined with the broth is the condensed shoyu tare as well as a some chicken fat seasoning oil. You can see in the picture of the soup in the ladle how oily the soup is because of the chicken oil. 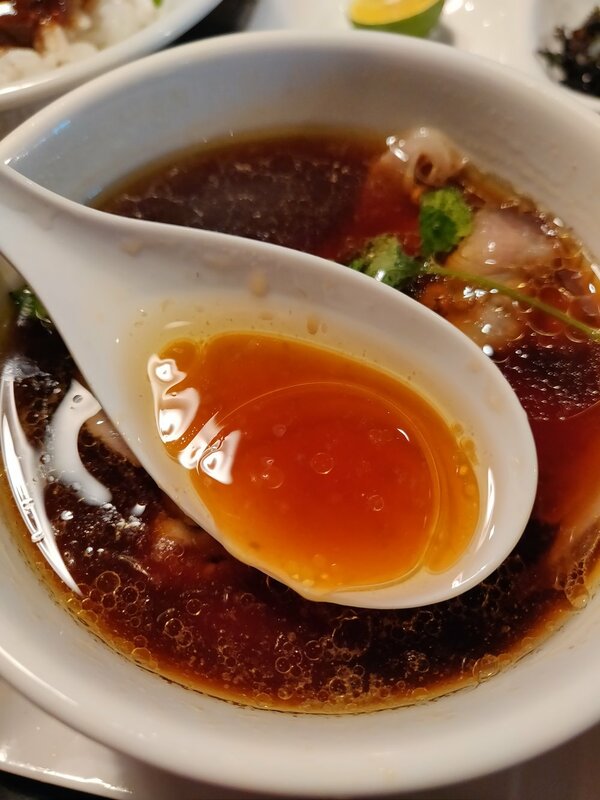 While the broth is nice and light, the oils bumps up the intensity and the mixture of the two ends of the spectrum pairs into quite a mellow soup. Toppings here were a bit forgetable, I actually forgot that I had a pork slice in there until the very end as the soup is quite dark and it had sunk to the bottom. While it was flavorful as it was soaking up all the tsukemen broth, it didn’t blow me away. The dried konbu was quite good however as it regained its shape after soaking up the soup. It adds a nice seafood flavor element and matched the overall theme of the dish. My favorite however was the addition of the sudachi lime. Sudachi is a variety of Japanese lime grown in the southern area of Japan. Much like regular limes, it has the sour notes, but is quite sweet as it is quite similar to mandarin oranges. I thought the sourness of the lime really helped cut through the oiliness of the soup and made it incredibly refreshing. While it wasn’t my favorite ramen I had of the Michelin Guide journey, this was definitely one of the most memorable. I had a great time enjoying the ramen here with Nama Japan and look forward to doing more collaborations with him in the future. We gave a rating of the ramen over on his video so check it out if you want to know what I scored it! Once again, thank you to Nama Japan for reaching out about this collaboration and be sure to follow him on social media. I’ll provide his links down below.